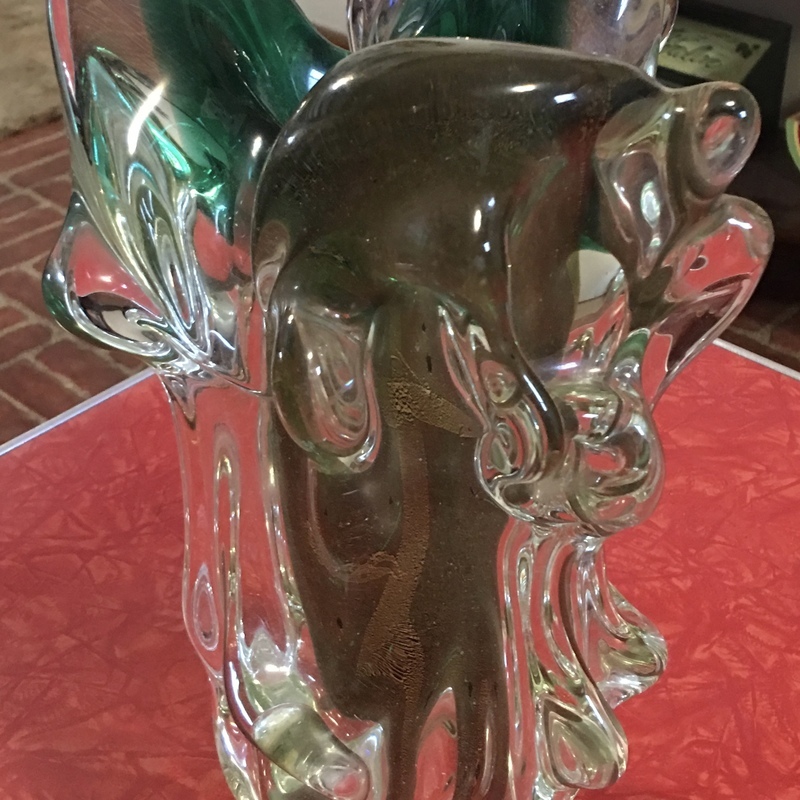 glass vase inherited from a great-great aunt, who claimed it was Murano. 12 and 3/8 inches tall, 23" circumference around bottom, interior 6 and 1/2 inches deep. estimated weight 25 lbs but that is a guess without a scale. It is solid glass and heavy. It has an organic free-style shape, predominantly green with metallic gold embedded. There is no etched signature on the bottom. The aunt died in the 60s so it is at least older than that. Great great aunt was wife of a successful retail western clothing store in Tulsa, Oklahoma. She traveled a lot and collected ceramic and glass pieces from her travels plus was gifted by multiple friends with such pieces from their travels. It was owned by my great-great aunt until her death then inherited by my mother who is currently in hospice care. I believe you have a Murano vase made by the factory Barovier & Toso. I really think its not older then the 60s. The green colour and the free blown form is something they started in that time period. Usually the work of the Barovier factory can be quite expensive but in general speaking the more controlled the proces was and the more techniques were used in that proces the more expensive those items were. Your vase was relatively easy to make. The use of gold foil is a typical Barovier way of adding effect to a piece of glass. Nice and heavy vase. Market is not that good anymore then some time back but still collectors are around to buy these. Online platforms but also local auction house can sell for you around the estimate, try to use an auction house with prescription on Invaluable, live auctioneers or other international platform.